Idaho Chicken Ranch: Dillon, Colorado! 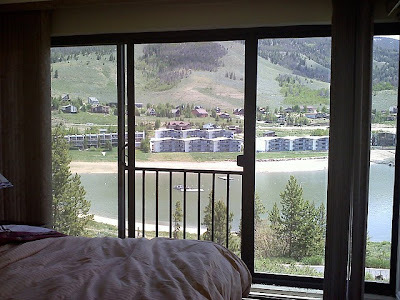 After a business trip to Denver, I booked myself some much-needed Amy down time...at a cute condo over looking Lake Dillon in Dillon, Colorado, about 2 hours out of Denver. I left late and was tired and getting confused...then suddenly I was driving through this super long tunnel...only to discover that I had driven under the Continental Divide via the Eisenhower-Johnson Memorial Tunnel. So cool! The peaceful view from the super-cute condo! The next morning I was feeling rummy and tired so took a walk. It only took me about 3 hours to realize the reason was that I was at nearly 10000 feet elevation! Yikes! On the flight back home I discovered this little fellow kickin' it inside Denver International Airport. Good digs if you can get 'em!